At last, my third design book, Styling with Salvage, has released. On Tuesday, April 3rd, thousands of books will ship to folks and I'm soooo hoping they will love it as much as I do. :) Putting a book together is a lot of work and a lot of joy! From weeks of interviewing, scheduling, flights, driving, styling, photographing, to writing, rewriting, and rewriting about 4 more times to final proofs and the long wait for the printing. 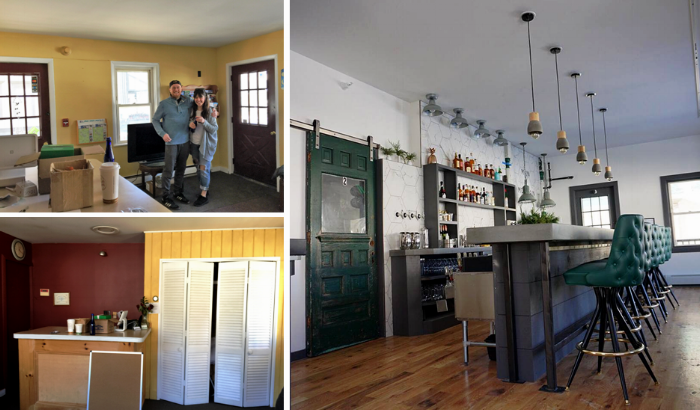 :) My absolute favorite part is meeting all these amazing folks who use salvage in their design, work and artistry. They are incredibly creative and I'm honored they wanted to be a part of the book. Thank you again for coming along on this journey. Thank you Susan Teare for the amazing photos and Countryman Press for publishing and Sharon Bowers for being a thoughtful and kind agent. THANK YOU TO ALL WHO OPENED THEIR DOORS AND HEARTS TO US! It has been busy here! So thrilled and excited with everything that is going on: First copy of Styling with Salvage book should arrive today, just named "one of the country's top creative people" by Country Living Magazine, design work --Bear Mountain Inn in Maine renovations started, Lawson's Finest Tap room is going up as I write this, the renovations to the bakery/restaurant now owned by James Beard Award Winner, Christain Kruse, Vergennes Laundry by CK, is complete, vacation barn/house redo mid-construction, Aspenti Health office spaces almost complete, and many more projects. But today, I'm exciting to share with you -- Main and Mountain Motel in Ludlow, Vermont! (insert drumroll). Eliza and Justin have opened the bar and are about to open their motel rooms. This place used to be called All Seasons and it sits on Main Street, just down the road from Okemo Mountain, the ski area. So hence the awesome new name, Main and Mountain, Bar and Motel. Notice the Bar comes first...that is because is has the most amazing lounge/bar in town. We turned a tiny lobby and the managers apartment in a fabulous space for everyone to enjoy. We are even turning the overgrown front lawn into a hangout spot, with gas fireplace and all. I can't wait for you all to see it... Opening January 2018! Here is what the lobby used to look like! How cute are Eliza and Justin -- the first day I meet with them in the old lobby. Now look at their cool space! Before picture -- of one of the nicest rooms. Almost done -- the green plaid shower curtains have arrives as well as the new blankets for the ends of the bed -- to add some color! Photo by Lindsay Selin. Doors and frames removed -- faux paneling removed and real wood v-groove added. Yes, I know I haven't written since April...where does the time go? Be prepared for a long but fun post. Gabrielle graduated high school and is getting ready to leave for college in a few weeks -- Wahhhhhaaaaa! Thankfully, we had a great family trip before she heads out. I'm not sure I'm ready but thankful I have some amazing projects to keep me busy. As you saw from the last post, it was an honor to be a part of the TruexCullins design team for the MOTEL MAKEOVER in Jackson Hole, Wyoming and their website is live. Check it out... Mountain Modern Motel. The MARINA store remodel at Gaines Marina, in New York is also finished! Visit their facebook page for all the fun things they do. I love that Motels are making a come-back. Bringing these oldies but goodies back to life is one of my favorite things to do. I'm currently mid-way through a ROADSIDE MOTEL renovation in Okemo, Vermont. Stay tuned. Looking for a VACATION RENTAL in Lake Fairlee, Vermont? You will love the new kitchen design and the fabulous birch tree wall in the bedroom (already a huge hit on Instagram). We are just days away from the completion of the remodel. I'll post the rental link when it's up! The remodel makeover continues at BASIN HARBOR CLUB with more updated cottages to dream away in and the BOAT CLUB BATHROOMS were fun to design. Check out the renovated LODGE ROOMS, LOBBY and CLUB ROOM...so much to see and do at BASIN HARBOR CLUB . STYLING WORK for Gardener's Supply Company, Eating Well Magazine, and Verilux Lights has continued to inspire me...check out the pictures below. Next...I'm about to dive into a VACATION HOME renovation (barn converted into home), cool designs have begun for a TAP ROOM for one of your favorite Vermont specialty beer companies, early-phase of design connecting for a complete makeover for an INN in Maine, and beginning a RESTAURANT project for an incredible chef! Don't forget to come and visit me at my upcoming DIY and Design PRESENTATION for the next COUNTRY LIVING MAGAZINE FAIRS (September in Ohio). PHEW...this should keep me from crying in my soup when Gabrielle packs her bags for college. Who am I kidding? I'm going to bawl like a baby. But enough words -- here are a few fun iPhone pics. (Professional shots coming soon). One of the guest bedrooms in the vacation rental on the lake -- keeping the costs down with some really simple -- yet bold -- decorating ideas -- including a photo wall mural of birch trees! More to come on this as well. This vacation rental redo will be really fun to tell you about soon! Almost done. With all the rain this summer, my peonies were amazing! The DIY's at the Country Living Fairs sponsored by Jo-Ann's Fabrics have been a huge success. I'm doing two more at the fair in Columbus in Septemeber. We were able to get away on a family vacation and we sailed the Greek Islands on the Sea Cloud -- trip of a lifetime! Close Up Details of the Updated Historic Lodge Rooms at Basin Harbor Club. Again, apologize for the bad IPHONE pictures -- better pictures to come. The renovated lobby, including the new art gallery wall! The new boat club at Basin Harbor, including a large dock for 60 boats, has its very own bathrooms with showers and a lounge room. LOVED doing these spaces! Cringing at my bad info pic -- but you get the "picture". The new boat house bathrooms for the docks on Lake Champlain! Gaines Marina Store in Rouses Point, New York, is just about done in this picture. Needs a little styling touch -- which will come soon in another post with an awesome before and after of this dock side marina and boat store! Succulents, Mugs and a Board...Equal a Wall Hanging Planter! Pom Pom Garland -- how much fun was this to make with my mom and daughter. It is so easy to make an acorn cap heart. 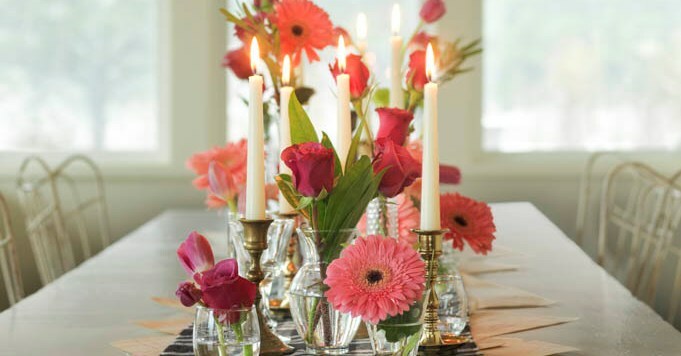 All you need is a drill and a stiff piece of copper wire. Add in some vintage brackets, pieces of old porch post (sprayed gold) and some vintage metal fencing and mini wheel -- and voila -- you have a gorgeous country living display. Old jewelry pieces turned into ornaments. I did this DIY's for DIY NETWORK. One of the many holiday projects I did for them. Table decor inspired by an apothecary look...These acorn lights are from Gardener's Supply Catalog -- a company I style for. Love them!! On my trip to Florida a couple of weeks ago, my Mom and I went shell hunting. We could not believe our luck when we found all these (it was after the super moon...). Add some faux leaves and berries and created a fun Christmas table display for her Florida home. 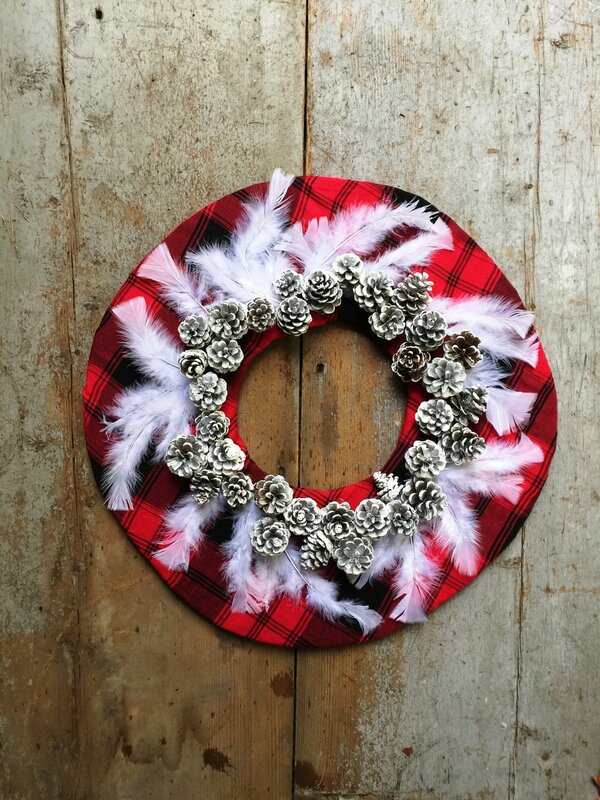 This plaid feather wreath was easy. Cardboard wrapped in plaid wool fabric. glue on. Then add some painted white pine cones and then feathers. Love this project. Add some pictures to a a poster board then bring it to your local blueprints shop -- and have them print them out on large blueprint paper...Instant personalized wrapping paper! Another popular DIY NETWORK project. A birch bark wreath. So easy to make. 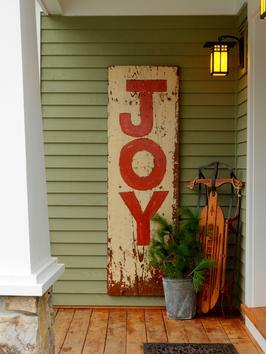 And who can forget my vintage inspired sign...Joy -- which I still put out every year! Step by Step on DIY NETWORK. Make and Take Workshop at the Country Living Fair -- WHAT A BLAST!! :) Paint: Repurpose ReColor by Cari Cucksey!